Three moves in less than four years might prove daunting to some, but if the move is up, it can be worth the wait and the work. During July's Gallery Walk, the High Street Painters studio is celebrating its new home with an Open House on the second level of the Mid-Town Mall building at 22-24 High Street in Brattleboro. The studio has evolved in stages from a space created in the fall of 2008 by Andrea Scheidler (co-founder of The Greenwood School in Putney) as a place for her to practice oil painting. After a long career in teaching and administration, Andrea had joined Novo Realist artist Richard Schmid's renowned Putney Painters group. When an accident caused her to give up her work with learning disabled children and to think of painting as a new career, Andrea realized she needed more space, social contact, and discipline than she had at home. The original High Street Studio was on the second floor, below the Brattleboro School of Dance -- a long room, just large enough for an artist to work on large canvases and to step back from her work. Then artist friends from around the Northeast, some with decades-long careers, began to gather to paint together there. As the space quickly outgrew its purpose, the High Street Painters (HSP) was born in 2009 and moved to a larger room on the ground level, next to the Backside Café. Passersby could look through the hallway windows to see artists at their easels, and the studio became a "window on art." In the spring of 2012, a new, still-larger space became available upstairs, across the hall from the original HSP studio and with easy, drive-up access. High Street Painters has spent several months acclimating to its new home. 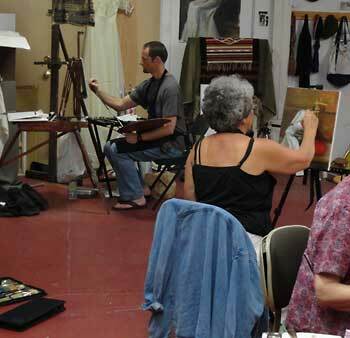 New lighting, a seating corner, and on-grade access make it ideal for members -- all of whom are representational painters -- to paint from the model or to set up individual still lifes. Several times a year, HSP hosts workshops for members and visitors, too. 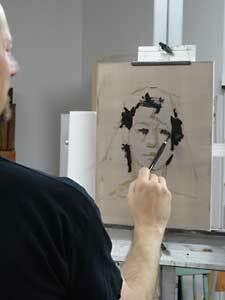 The first workshop in the new High Street Painters studio was with a longtime friend, Chicago artist Clayton Beck III. (Beck also studied under Richard Schmid and has been an anchor for the High Street group.) 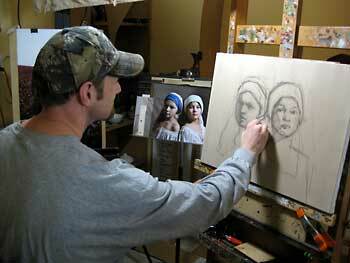 Tacoma, Washington artist David Gray taught an exciting four-day Classical Still Life workshop at the end of June. Gray is among the celebrated artists exhibiting in the Bennington Center for the Arts' current realism show, "Artists for the New Century." Gray's workshop was attended by "HSPs" and by still life painters who came from as far away as Québec and California. The High Street Painters' open house on July 6, from 6 to 7:30 -- featuring food tasting and sales by North End Market and Jasmine Bakery, and wine-tasting with Windham Wines -- is co-sponsored by neighbors David Walter Jewelry and Bodhi Fit, a fitness studio.